Hello all! 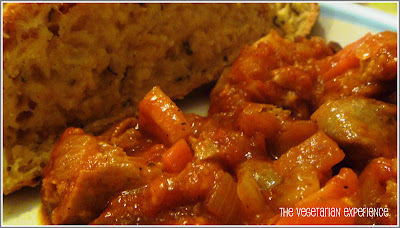 I haven't posted a vegetarian post for a week - we have had intermittent internet access at home and so I haven't been able to blog this recipe which I have been hanging on to for a week or so. Isn't it funny that we rely on the internet so much these days - I have been getting withdrawal symptoms from not being able to post! So to start the week, I am featuring a Sticky, Sweet Vegetarian Sausage Stew. 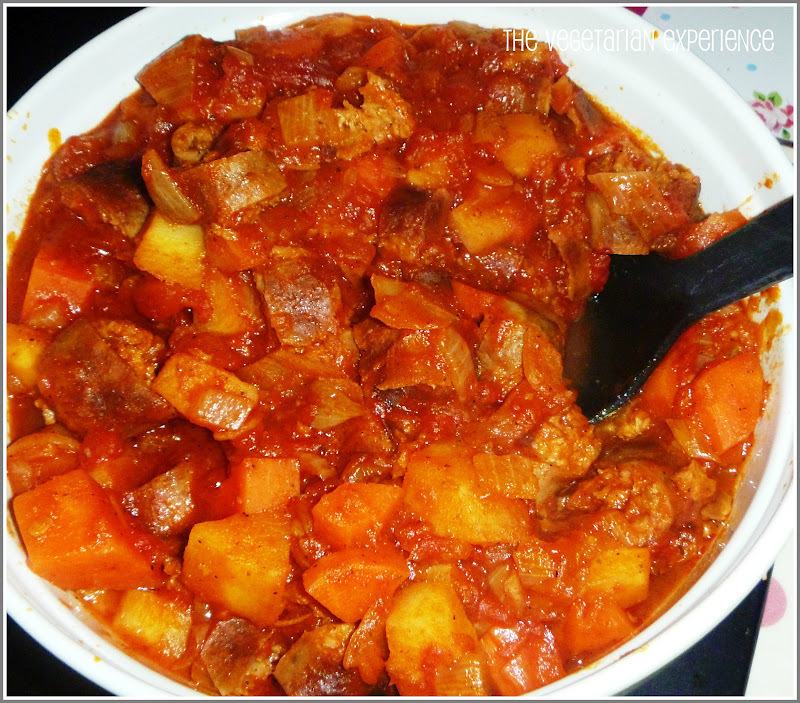 When I cooked this recipe, the weather was cold and snowy, and it was a real winter warmer. However as the weather is slowly starting to improve, this hearty dish is still a fabulous meal to place on the table for the family to eat together. I love one pot or one dish cooking which the family can share out together, and this recipe certainly hits the spot. I cooked my Sticky Sweet Vegetarian Sausage Stew twice - once on the hob and once in the slow cooker. Although the dish tasted delicious cooked on the hob, I much preferred the ingredients cooked in the slow cooker. The flavours fused together so well and the fact that they had so long to cook really bought out the sweetness of the dish, which I absolutely love, juxtaposed with the savoury ingredients in the recipe. The name - Sticky Sweet Vegetarian Sausage Stew may sound a bit too sugary if you don't have a sweet tooth, but the rest of the flavours give a really good balance to the dish. I recommend giving the recipe a go and then let me know what you think! Brush the vegetarian sausages with oil and cook them under the grill for about 15 minutes or until browned, turning as required. Heat the oil in a pan and fry the onion over a low heat until it is transparent (around 5-6 minutes). Add the carrots and parsnips to the pan and continue to cook for a further 5-10 minutes, or until the vegetables have begun to soften. Add the apples and the honey to the mixture and continue to cook for a further 2 minutes over a medium heat. Add the tomatoes, tomato puree, vegetable stock, hot water, chilli powder, paprika, mustard seeds, salt and pepper to the pan. Combine the ingredients together well, cover, and cook for 10 minutes. By this point the sausages should be cooked. Chop them into chunks and add the sausages to the pan. Cover and cook the mixture for a further 20 minutes, stirring regularly. (You can add extra hot water if the mixture is getting too thick). After 20 minutes, the vegetables should have softened and the flavours should have fused well together. If not, cook in 5 minute increments until this has happened. Once ready, remove the mixture from the heat, allow to cool slightly and serve immediately. We served ours with Cheese and Chive Bread. Next, remove the pan from the heat and add the ingredients to the slow cooker. Slice the sausages into chunks and place them in the slow cooker also. Place all of the other ingredients in the slow cooker, and add an extra tablespoon or two of honey to the mixture to bring out the flavour in the slow cooker. You may also need to add extra hot water, so that all of the ingredients are covered by liquid. Cook either on low for 6 to 8 hours plus, or high for 4 to 5 hours. You can also freeze this once cooked. I think I might try this as my hubby loves all things sweet and I can see that the combination of ingredients would appeal to him. Thanks Sheffy, let me know how it turns out! This recipe looks amazing...going to give it a go myself. Thanks for joining into Slow Cooker Sunday and it was great to see you today. Oh fab, I like the sounds of the sticky and sweet as I'm a recent convert to slow-cookers and have been wondering how to have some liquid other than juices! Hi glad you found me! I wonder about other liquids too. So far I use tomatoes with juice, baked beans with juice, honey, or stock. I think that maybe wine and cream could work, as could things like soy/tamari or worcestershire sauce. Am still thinking of others! I think my kids are going to love this recipe.I'm holding a weekly linky Viva Veg! for vegetarians and veagns if you would like to add any recipes, old or new to it.I hope you get your internet sorted soon it can be a pain in the arse not having proper internet access. 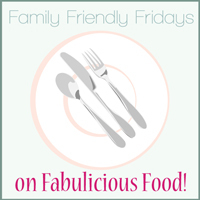 Thanks Aly - I have linked up a few recipes - let me know what your kids think of the recipe!